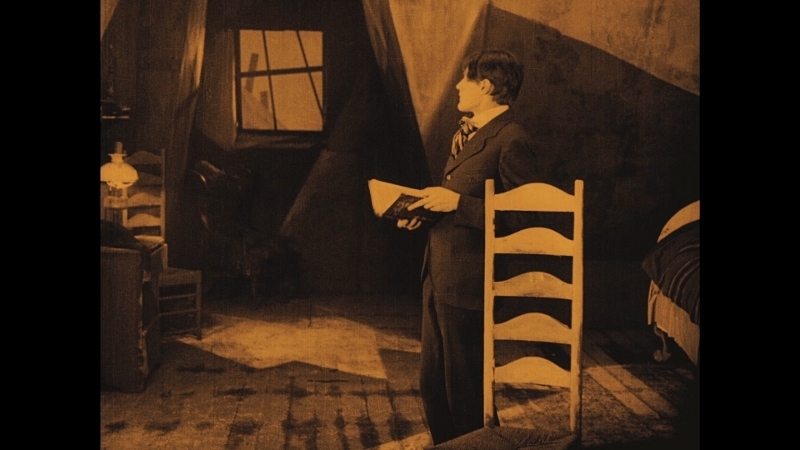 Visually striking and impossible to forget, Robert Wiene's The Cabinet of Dr. Caligari (1920) is one of silent film's most enduring productions. Regarded by late guru Roger Ebert as "the first true horror film", this color-tinted fever dream was several decades ahead of its time and still holds up well today. As one of the landmarks in German Expressionist filmmaking, it's as interesting to look at as it is to dissect, whether you've seen it countless times or haven't had the privilege yet. Our story is told by Francis (Friedrich Feher), who details an account of himself, his friend Alan (Hans Heinrich von Twardowski), and their first meeting with sensational Dr. Caligari (Werner Krauss), who keeps the young Cesare (Conrad Veidt) under hypnosis and parades him around like a sideshow attraction. To their amazement and shock, Cesare predicts that Alan will die within the next day. After his prediction comes true, it's unknown whether a serial murderer (Rudolf Klein-Rogge) is the culprit...or somehow, Dr. Caligari and his "pet" are involved. Wiene's film caused quite a stir upon release and has only grown in popularity since then...enough to inspire an unofficial (and poorly received) 1989 sequel, as well as a handful of remakes. DVD Talk has even covered two of the latter, but the lack of hyperlinks on all accounts should encourage fans that they're not missing anything of interest. It's not as forward-thinking as Metropolis or as nightmarish as Nosferatu, but there's no argument that Caligari has secured its position alongside those silent film classics. Anyone new to this period should consider Wiene's film an accessible entry point, as its ambitious visual design has more in common with a Tim Burton production or stylish animated feature than something that existed years before automatic traffic lights and the iron lung. Caligari's fractured format (which includes the use of framed flashbacks, an unreliable narrator, and even a twist ending) still holds up nicely, ensuring that there's much more to the film than expressive set design. The story, written by Hans Janowitz and Carl Mayer, isn't particularly detailed: even at just 78 minutes, the intertitles lengthen a plot that wouldn't last more than an hour in "talkie" format. But as a whole, Caligari's intriguing premise and execution are the reasons why it still remains vital, fresh, and entertaining...and, if you've never seen it before, now's as good a time as any. Aside from handful of mixed-quality DVD editions during the last decade or so, The Cabinet of Dr. Caligari has already been released on Blu-ray in various foreign markets including, most recently, a Region B release from Masters of Cinema. The main difference---aside from an obvious bump in resolution and better encoding, of course---is entirely due to the source material, as these Blu-rays utilize a new 4K restoration completed earlier this year. This new domestic release from Kino Classics follows suit, bringing the excellent new A/V presentation to American audiences unable (or unwilling) to delve into the wonderful world of region-free playback. It's a solid package if not slightly inferior to the MoC edition...largely due to its collection of bonus features, which is passable but not overly impressive. Presented in its original 1.33:1 aspect ratio, The Cabinet of Dr. Caligari has never looked better on home video. Kino's new Region A Blu-ray appears to use the same source elements as Masters of Cinema's well-received Region B release; specifically, a new 4K restoration highlighted by a reconstructed first reel. 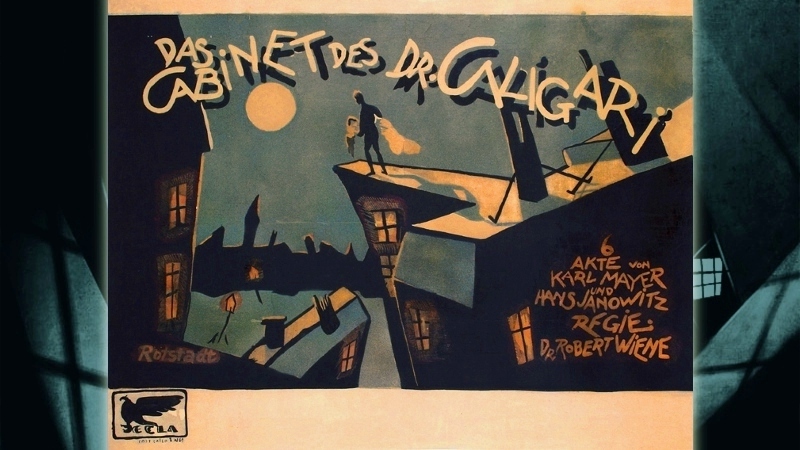 Using a variety of sources including two nitrate prints from Latin America, a 1935 16mm print and more, this careful treatment of the film's opening scenes makes a world of difference, and those who owned previous versions of Dr. Caligari in a variety of formats should be extremely pleased with the improvements. But the rest of the film looks even better and showcases strong image detail, excellent contract levels, careful treatment of the color tints, a natural layer of film grain, and even the presence of the original German intertitles. Of course, there's still plenty of dirt, debris, fluctuations, and missing frames here and there, but it's perfectly understandable. Overall, this is terrific treatment of a visually ambitious production...and if nothing else, those new to the genre should appreciate that a film nearing its 100th birthday can look so good. DISCLAIMER: The promotional images featured in this review are strictly decorative and do not represent Blu-ray's native 1080p resolution. The default audio track features a score from the University of Music, Freiburg presented in DTS-HD 2.0 Master Audio (although the MoC Region B release also includes a 5.1 option). This is a wonderful track that seems perfectly suited to the main feature, alternating between somber, mysterious cues and occasional lighter moments. Dynamics are excellent and channel separation is strong...and what's more, the music grabs your attention without distracting from the film itself. Optional English subtitles are included to translate the German intertitles and opening credits. Though it's technically an extra, we also get an exclusive Alternate Music Track by Paul D. Miller, aka "DJ Spooky" (check out a sample here). This is an...interesting option, although I'd imagine most silent film purists will dismiss it outright for its much more modern sound. Even so, there are occasional flashes of brilliance and some of the music manages to complement Caligari's quirky visuals quite well...but I'll admit that most of it feels more distracting and repetitive than well-timed to the story, as if it was written beforehand and pasted to fit. Either way, I can't ignore one part of this score---which begins around the 30:00 mark and last about 7 minutes---as a near-cover of Radiohead's "Everything in Its Right Place", enough so that I scanned the credits for an acknowledgement (there was none). DJ Spooky is obviously a fan, so one would hope this was a respectful "tip of that hat" and nothing more. The menu interface is smooth, simple, stylistically appropriate and loads quickly with minimal distractions. This one-disc package is housed in a standard keepcase; also included is a Booklet with technical information and an essay by film theorist Kristin Thompson. A framed matte-finish slipcover replicates the original expressionist artwork. Aside from the alternate audio track (detailed above), we also get a few traditional extras on this one-disc release. 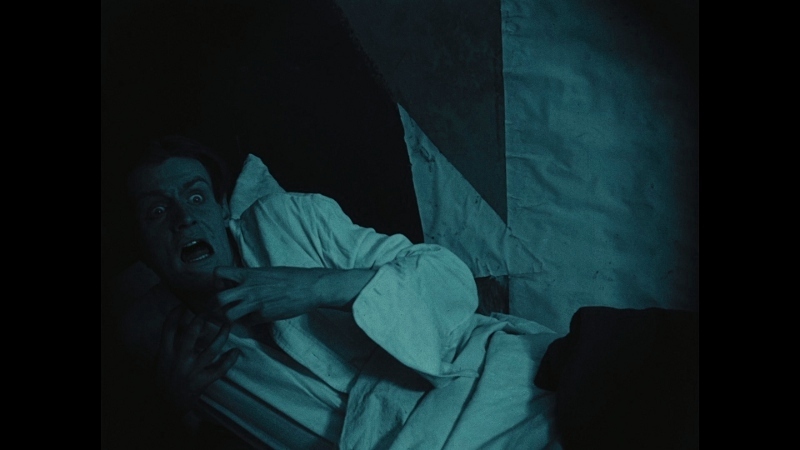 The main supplement is "Caligari: When Horror Came to the Cinema" (52:00), an 2014 IKSV Film production by first-time director Rudiger Suchsland. 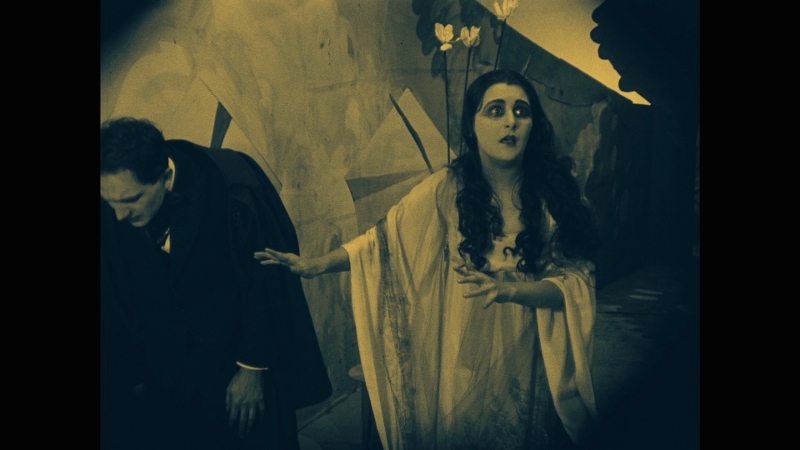 Detailing Caligari's influence during the rise of expressionist films and, interestingly enough, comparing it to filmmaking in recent years, this documentary also contains footage from World War I, Germany's Weimar Era, and other period films. Just for the record, this piece is also included on MoC's Region B release, but the remainder of these extras---and, of course, the alternate audio track---appear to be exclusive to this edition. We also get two Restoration Demonstrations (two segments, 4:00 total), although they do little more than compare older footage---some original, and some from a previous restoration---with no voice-over or context to explain how the restoration work was actually done. A brief Image Gallery is also included, as well as the Kino Trailer for Caligari's re-release and a handful of Previews for related titles like Metropolis and Nosferatu. Much like the main feature, optional English subtitles have been included during applicable bonus features for translation purposes only. Whether you're new to silent film or have dug deeply, The Cabinet of Dr. Caligari represents a striking vision decades ahead of its time and, in many respects, has aged particularly well for a film approaching its 100th birthday. The recent 4K restoration has been used on several recent Blu-rays (including Masters of Cinema's excellent Region B release last month) and this domestic edition by Kino is no exception. Featuring a terrific A/V presentation and a few interesting bonus features (including an exclusive alternate score), it's well worth picking up for those unable to play import titles. Ideally, owning both would give die-hard fans the complete package (and, pound for pound, the MoC edition is superior), but this low-priced disc is well worth owning for new and seasoned fans alike. Recommended.